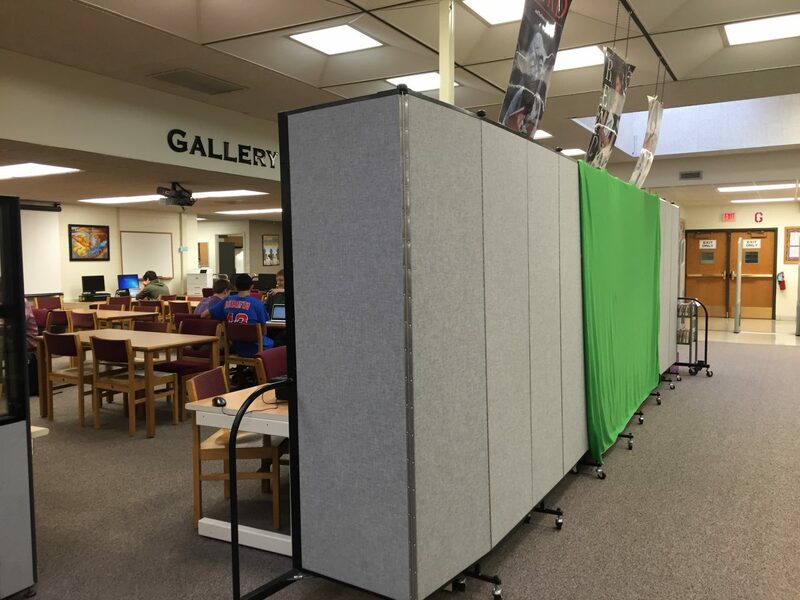 Uses: Education, Elementary School, High School, Library, Middle School Colors: Blue Lengths: 11 panel 20'-5" Heights: 6'-0"
The staff of the Downers Grove North High School (DGNHS) Library contacted the Screenflex sales team looking for simple space dividing ideas. After listening to the customer’s needs, a longer unit was the solution to sectioning off the space needed in the library. A 6-feet unit still allows the light and HVAC system to reach the sectioned off space. Because of the sound baffles and two layers of insulation used to create each panel, the library was able to enjoy the added sound-absorbing qualities the portable walls offer. “I’ve been meaning to let you know how much we’re enjoying our Screenflex divider at the Downers Grove North High School Library! It’s been perfect to keep out the visual and sound distractions in our open library space so we can instruct in our “Gallery” area.